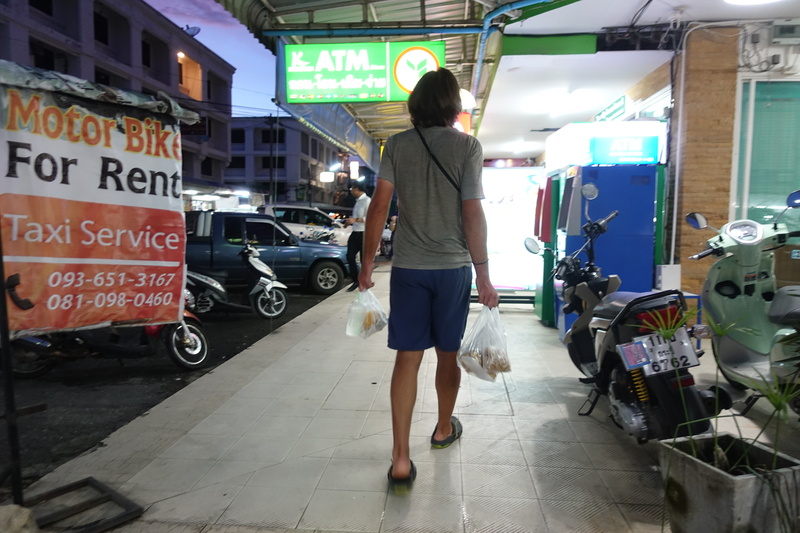 After Cédric and I successfully entered Thailand at the Satun port, we quickly made our way to our guesthouse in town before nightfall. 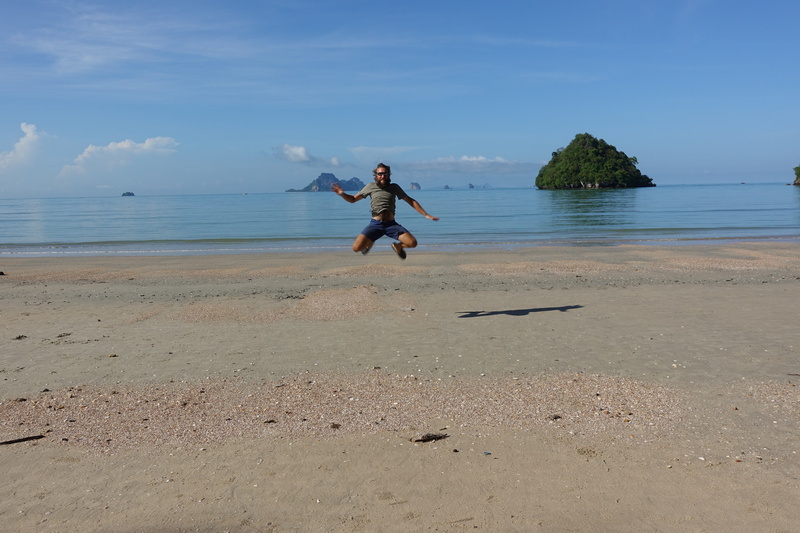 Thailand felt immediately much quieter than Malaysia, with a lot less traffic and motorbikes instead of big lorry trucks – it also helps that Satun is on a dead-end road! 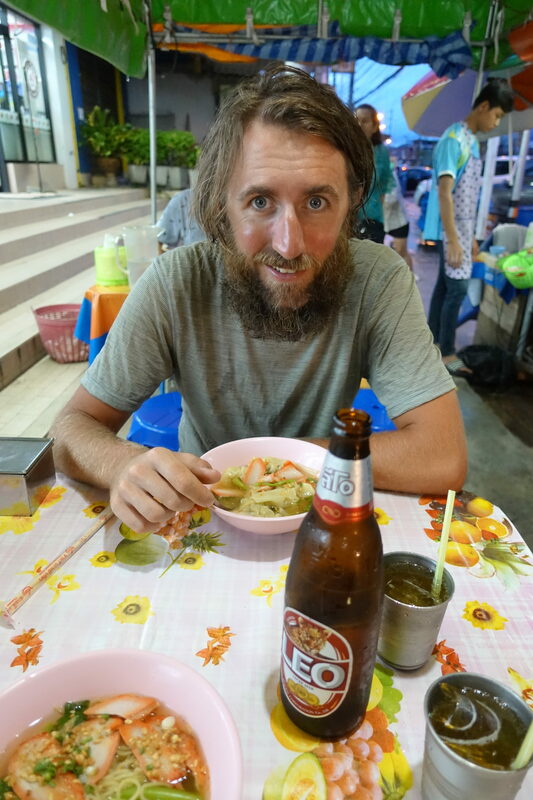 Being a bit late due to a delayed ferry crossing, and really slow customs procedures, we decided to stay at the resort and ‘’cook’’ our meal that night (that would possibly be the only time we would do that in Thailand, it is simply both faster and cheaper to eat out!). Just as we settled in and started boiling water for a dinner of instant noodles, the looming rain clouds released an epic downpour – ah yes, it’s the monsoon season. 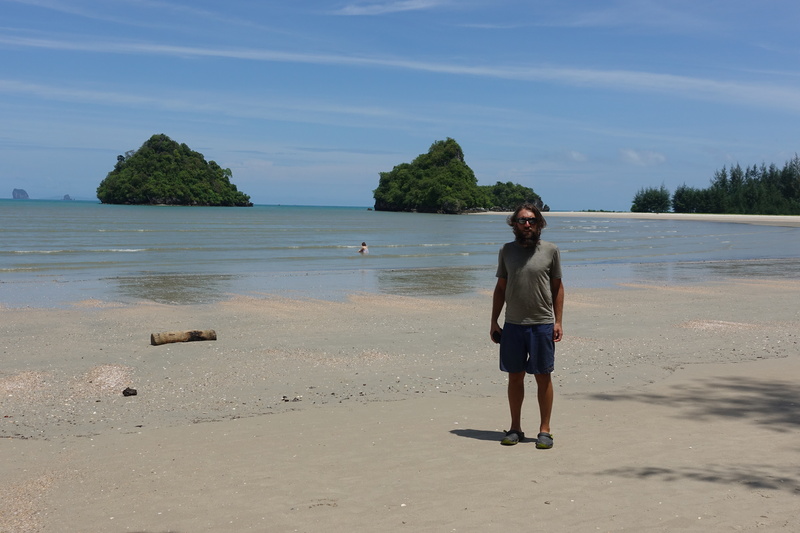 Not sure if it is luck or anything else, but we found amazing that the weather literally changes at the border, without any specific geographical features that could explain the changes between Thailand and Malaysia (if some meteorologist reads, he is welcome to explain…). 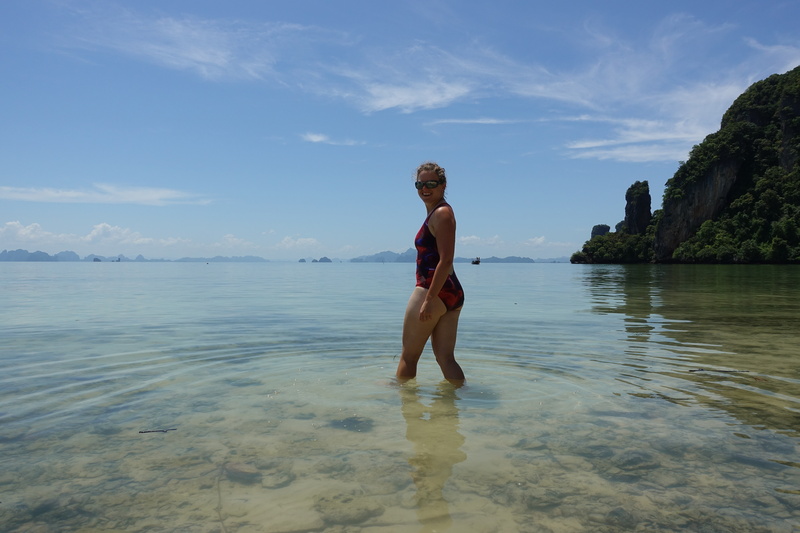 But, yes, going across the borders means going from a strong sun, heat and crazy humidity but no rain in Malaysia, to clouds, scattered thunderstorm, rain showers … and a much more enjoyable climate in Thailand! 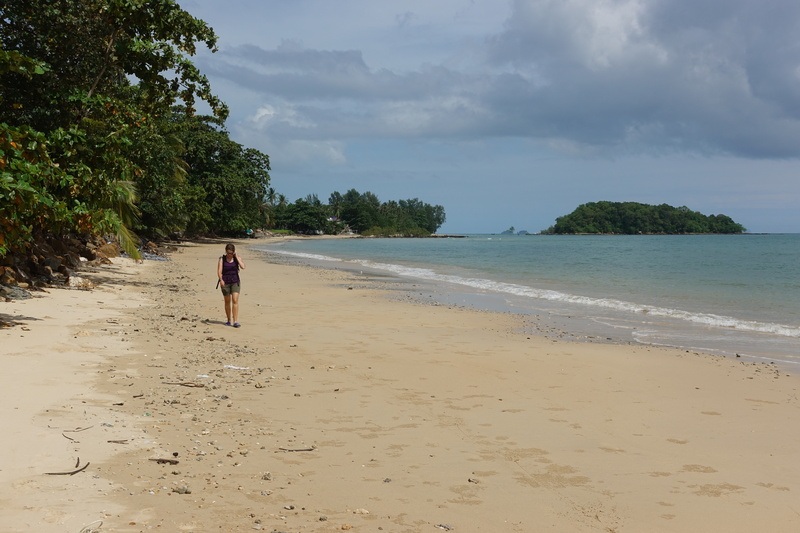 The next day as we set out north, we noticed that the main roads didn’t seem as busy as in Malaysia and had ample shoulders. 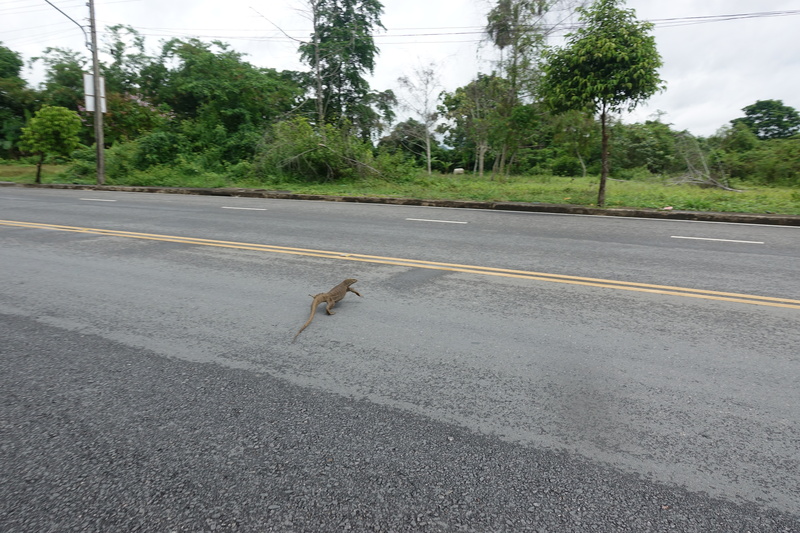 Road infrastructure just seems to be getting better and better in each country since New-Zealand! 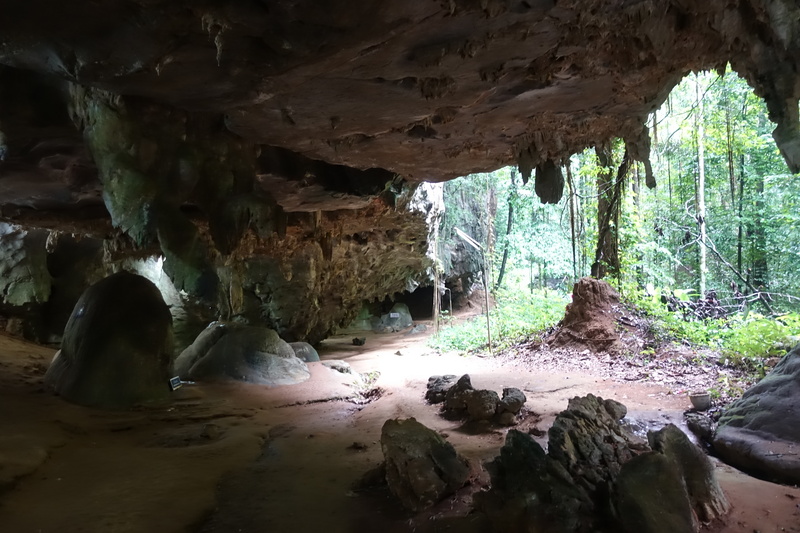 The cloud coverage also provided excellent protection from the sun’s rays, so we were no longer desperately seeking shelter whenever we stopped. 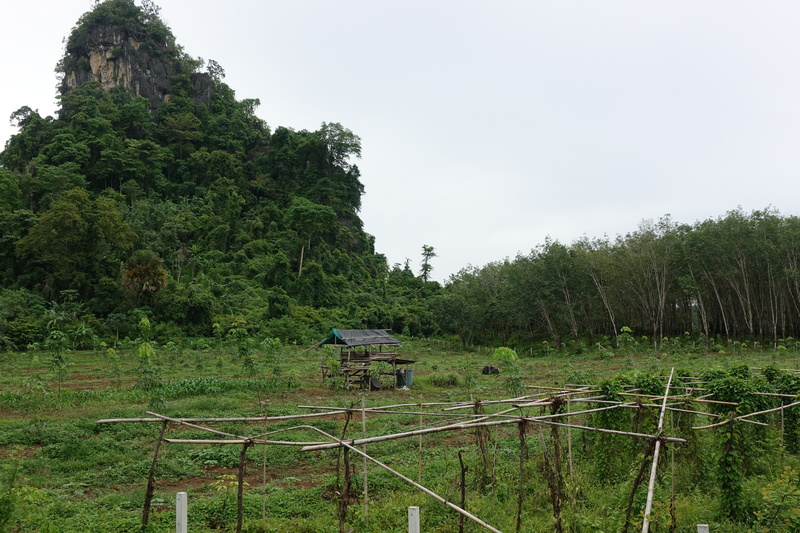 However, we still needed to be wary of what the clouds were holding, because we had a few small showers during our lunch break in La Ngu. 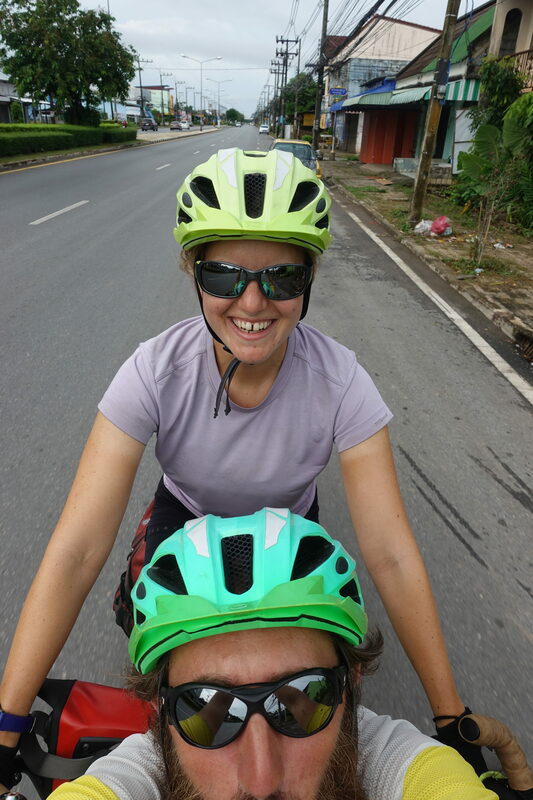 Whoever sits in the front seat of the bike also gets the mission to detect black nasty clouds on the horizon and plan a coffee break whenever the cloud will be over us! 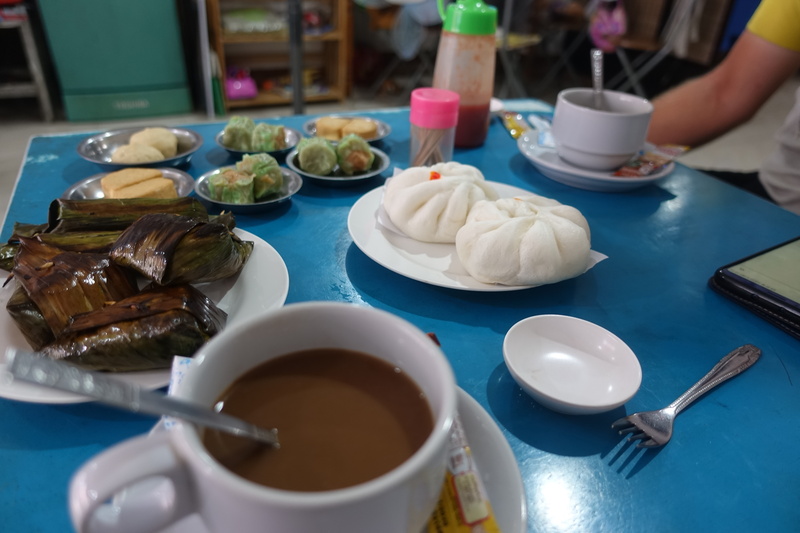 And thus, later that afternoon, we reached a small coffee shop in a village just in time to avoid a heavy monsoon downpour. 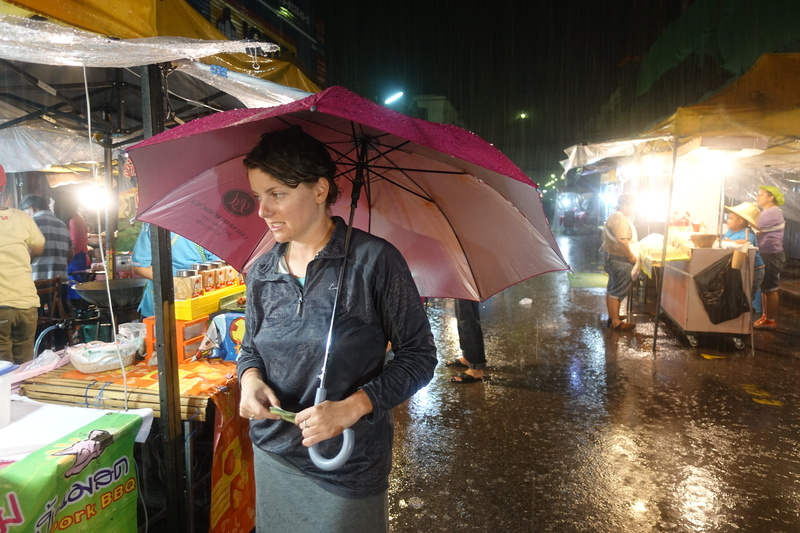 Our evening was spent searching for food in the markets of Thung Wa (it was the last day of the end of Ramadan celebrations) and hiding from scattered showers. 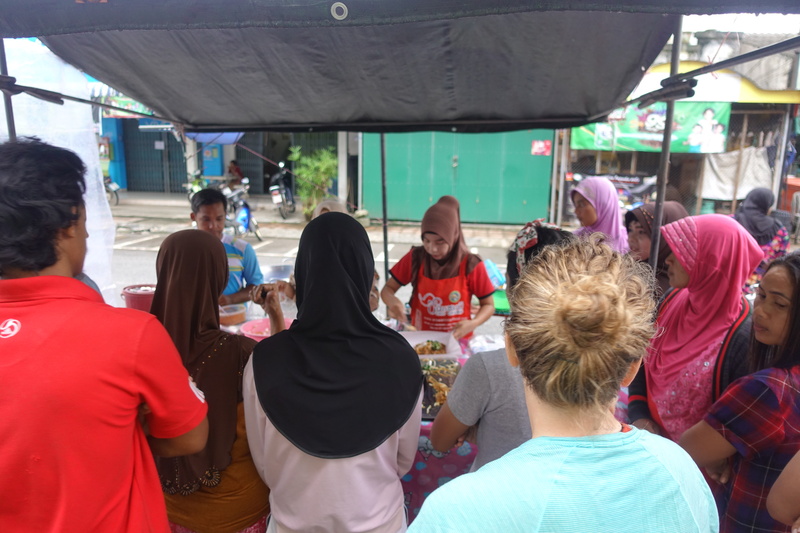 Southern Thailand being predominantly Muslim, the food is fairly similar to the Malay cuisine, and we finally managed to get dishes we could not try on the other side of the border due to Ramadan. 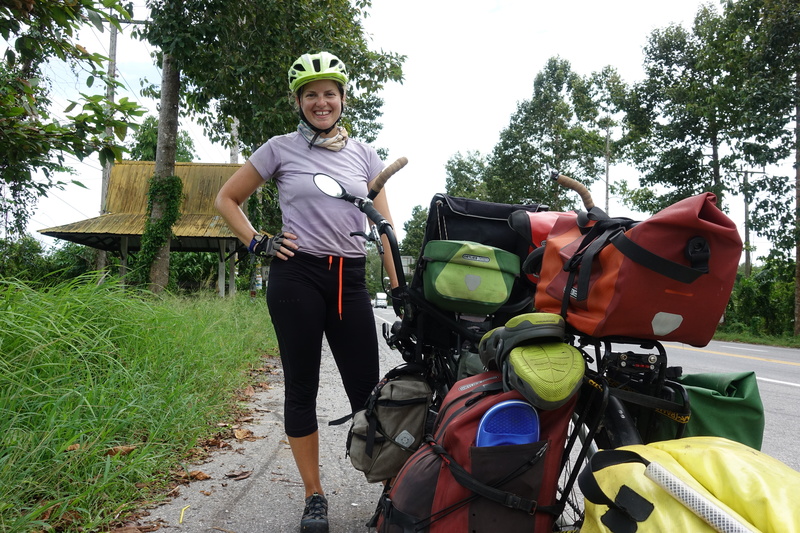 Cassie, mastering the art of piloting a 220kg bicycle! Hiding from a downpour, one more coffee! Waiting in line to get PadThai (noodles) – some guy had doubt that Cassie would ever be served and made her cut the line. 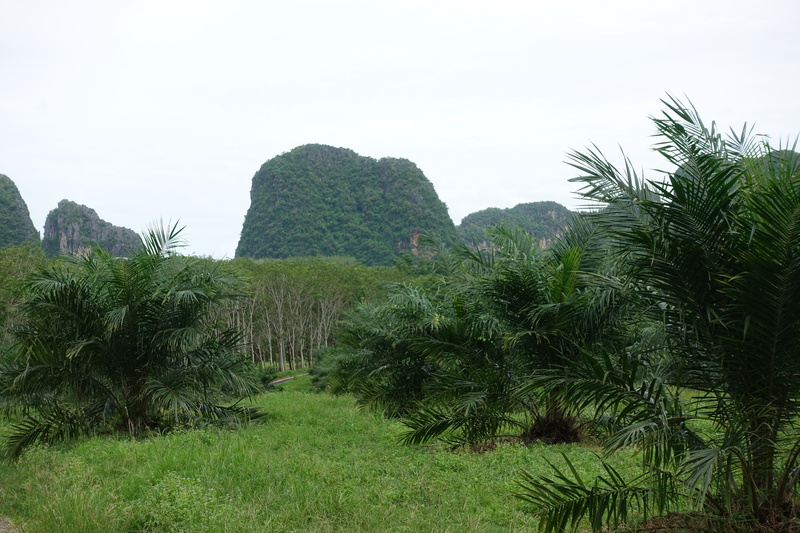 The next day, Cédric and I cycled towards Trung. 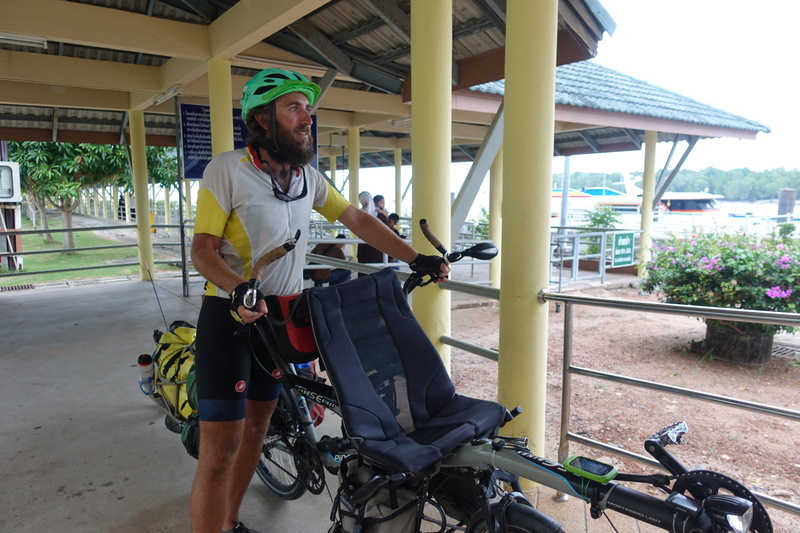 It wasn’t long after we departed Thung Wa that we were caught in a downpour and sought refuge at a police station on the side of the road. 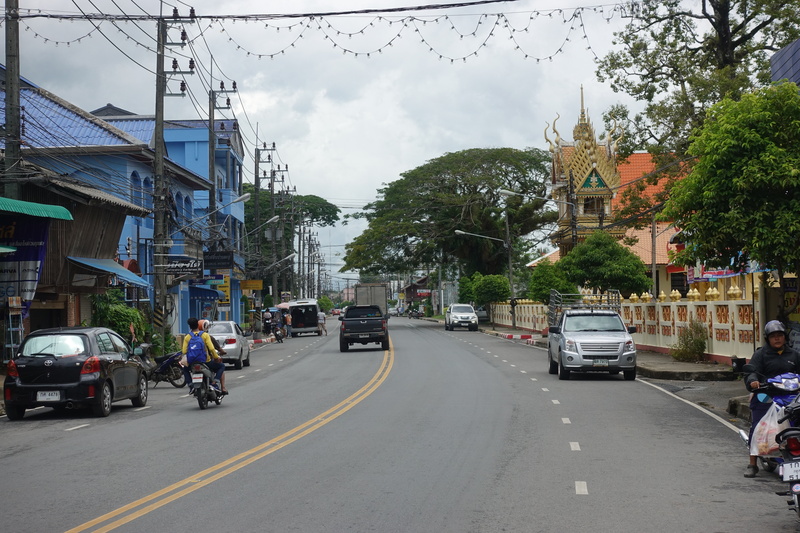 As the rain eased, we continued our journey down the provincial roads through palm plantations and stopped for lunch at a small town along the way. 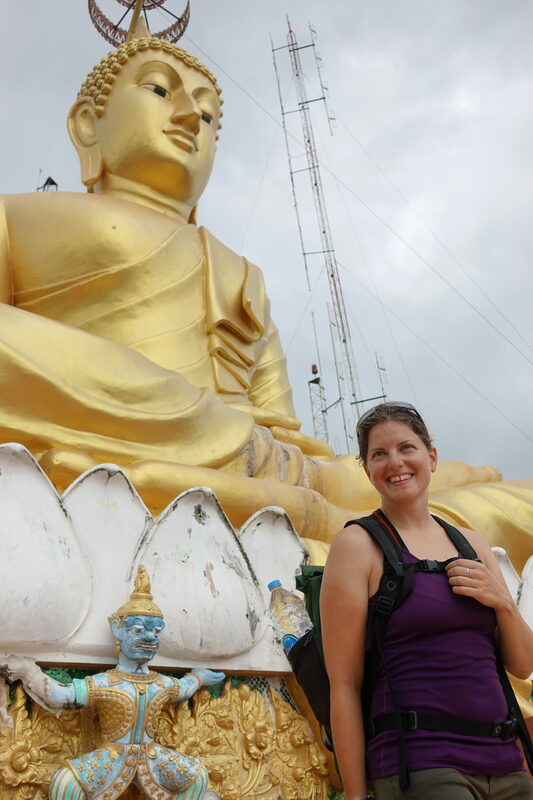 We ended our day’s journey in downtown Trung, just as another shower was forming (you might see a theme here in the monsoon season, but the monsoon was not as inconvenient as it may sound – as long as you find a roof to hide half an hour!). 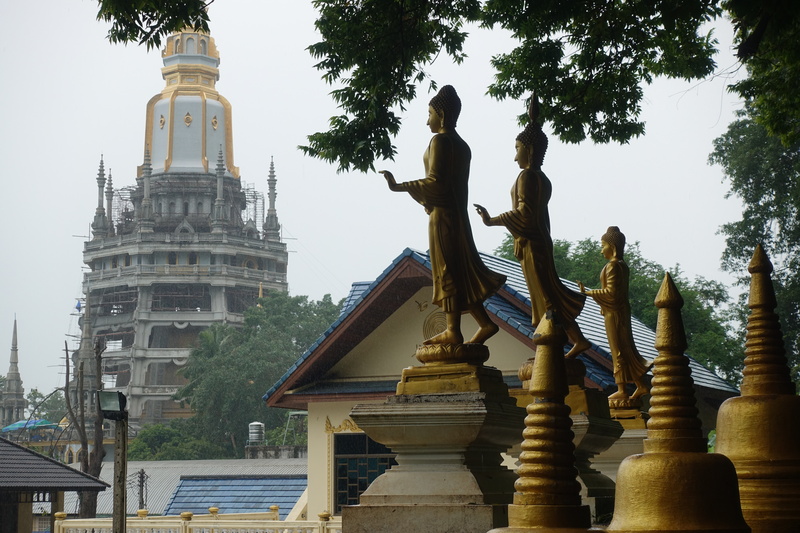 Our evening was spent wandering the city in search of some temples and food. 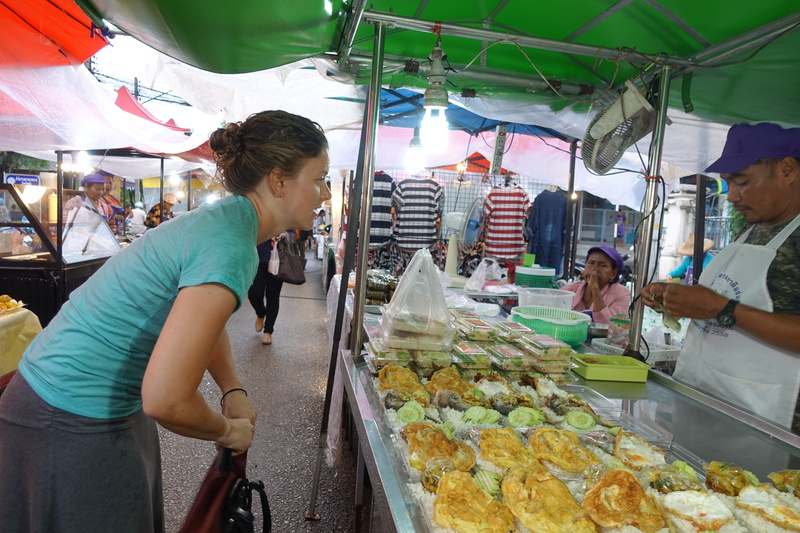 In Thailand, evening markets exist in virtually every town and city – and it’s an excellent option to try some of the local fare. 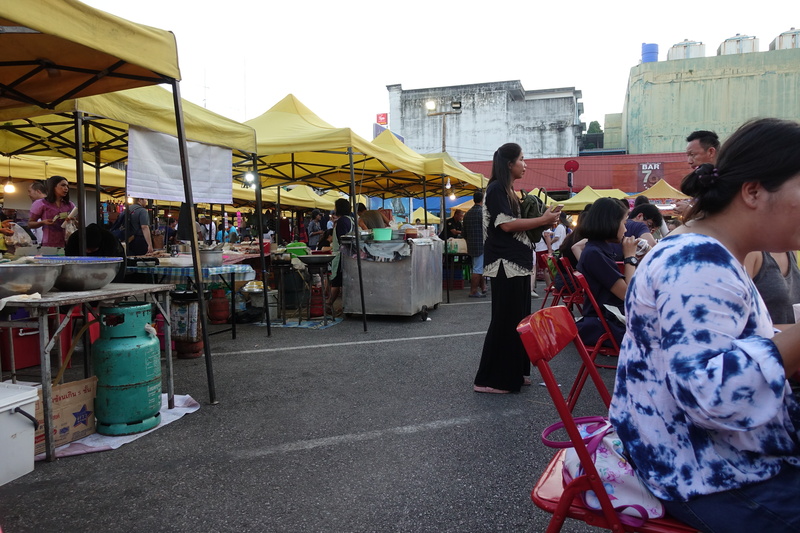 The markets sell a variety of things: meat skewers, rice dishes, noodle dishes, sweets, crepe, fruits, drinks… the list goes on. All so cheap that we do not ever try some currency conversions. For 1€/$ you get a full meal, for 2€/$ it’s a feast, for 3€/$ you get drinks included and possibly enough for the next breakfast! 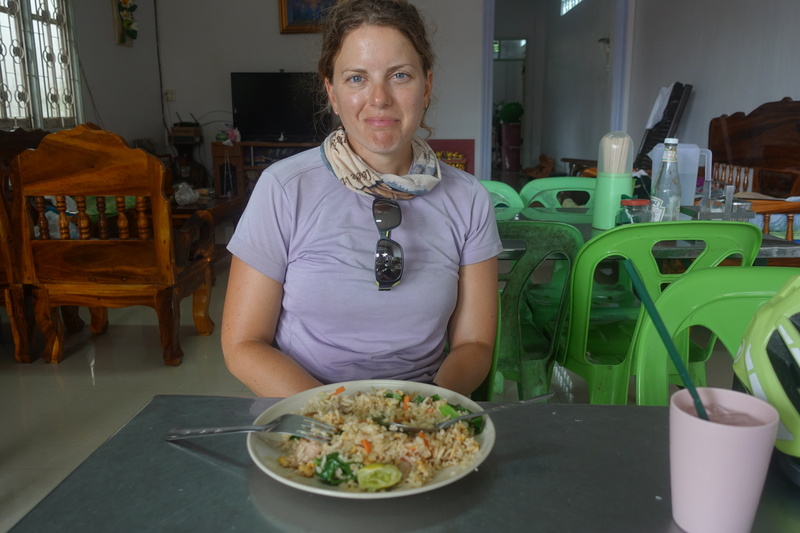 In case of doubt (we often have no idea what we are eating) or little willingness to go crazy with new dishes (some like it hot in Thailand…), there’s always the easy solution of fried rice. 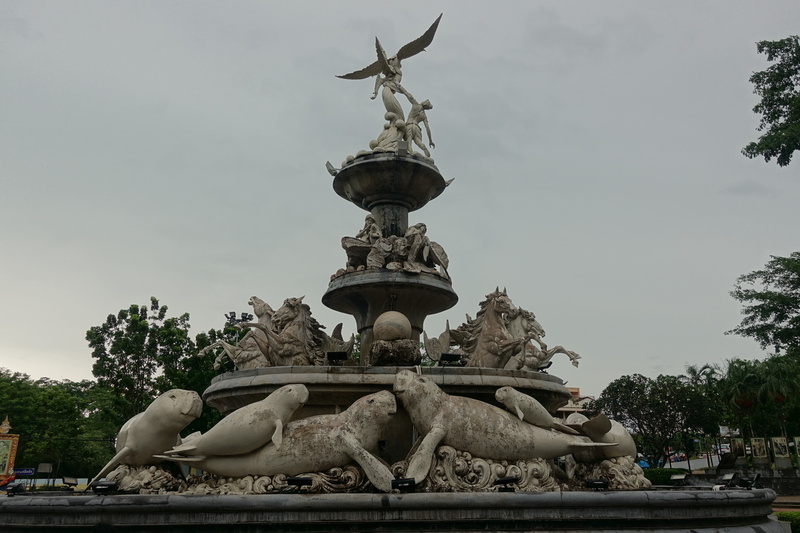 A fountain in Trung. 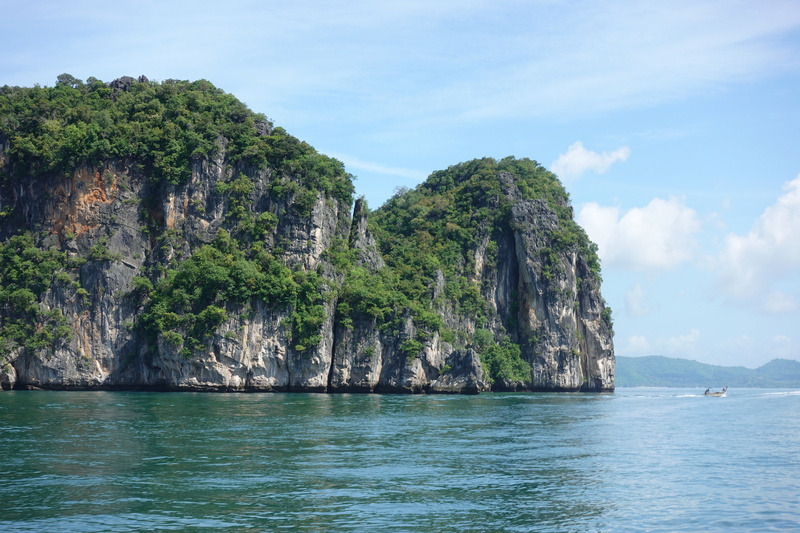 Apparently dugongs exist in Thailand too- at least in concrete. 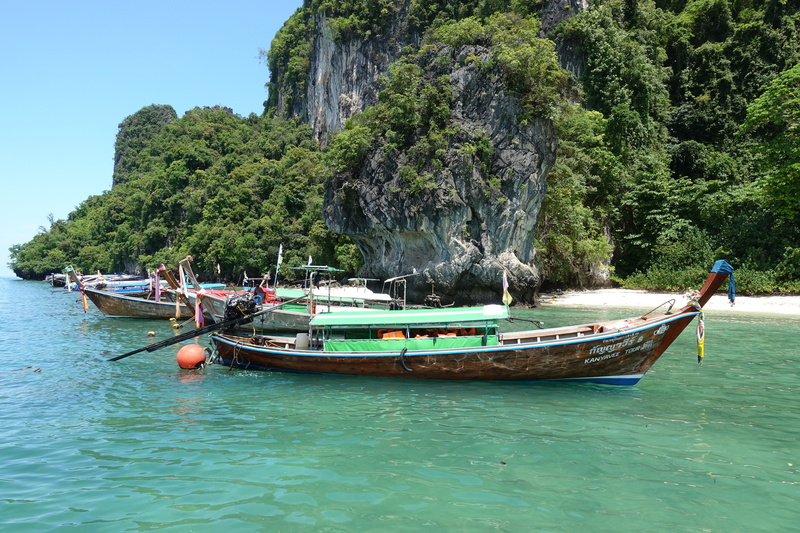 After a night of rain showers, our morning departure was sunny and warm. 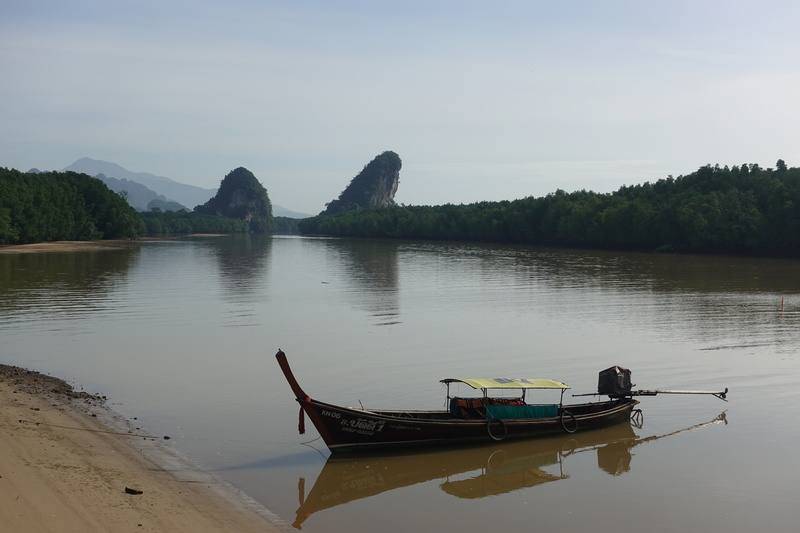 We continued cycling near the coast and saw the unique karst landscapes of Thailand starting to emerge. 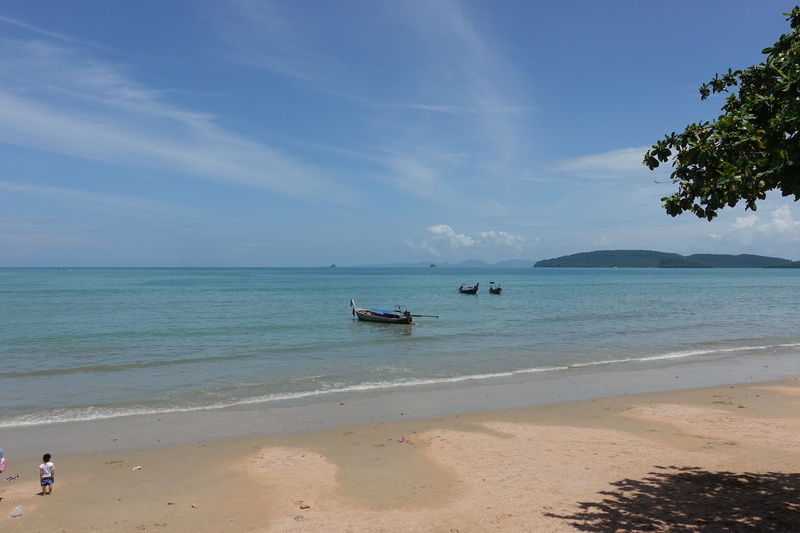 We stopped for lunch at a roadside stall just in time to avoid another short downpour. 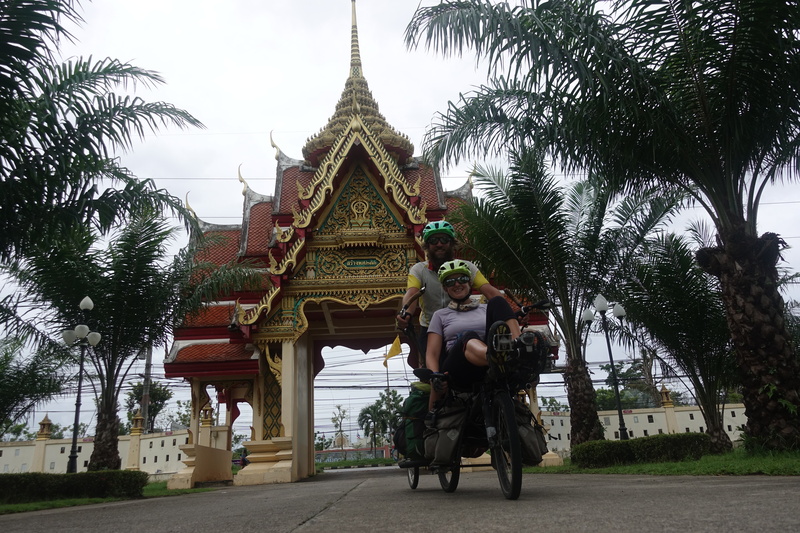 Continuing north, we left our quiet roads and joined the Highway 4 for the last stretch up to Khlong Thom for the evening. 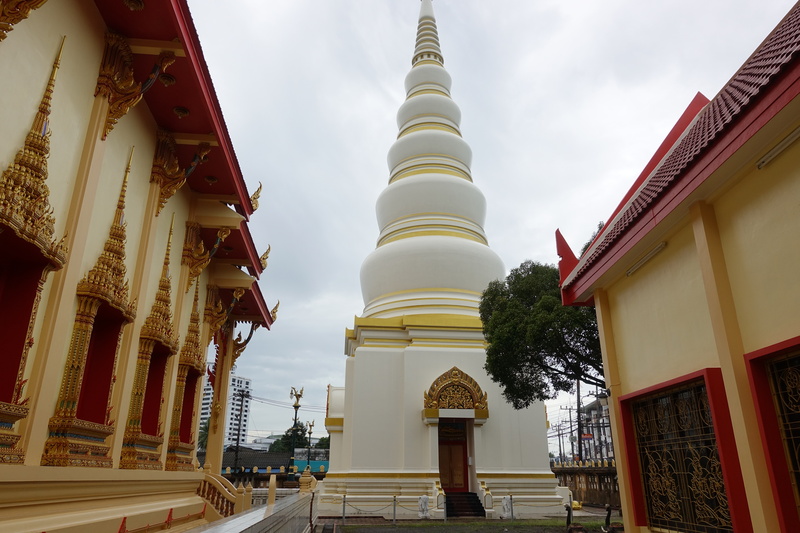 The Buddhist architecture here is different from Malaysia (still Buddhist, but more like Cambodia or Myanmar type of Buddhism – vs. Chinese Buddism in Malaysia). Note that we have no idea of whatever philosophical meaning is behind! 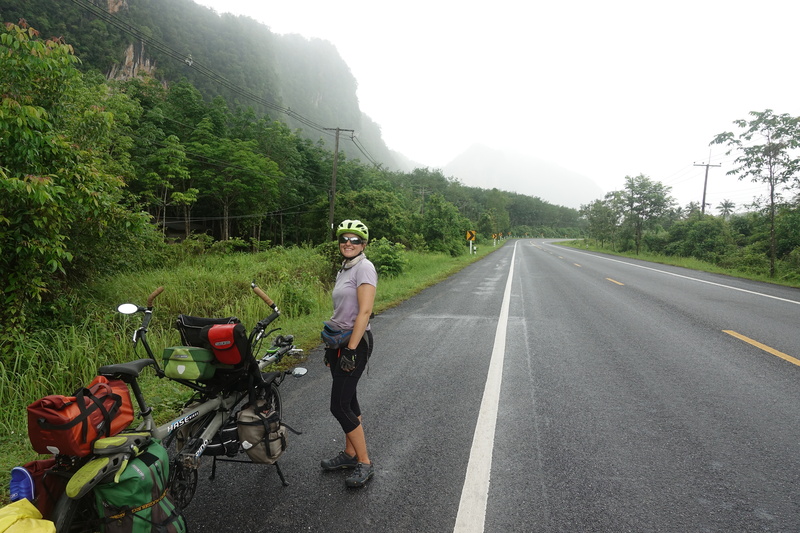 Amazing road quality, little traffic and almost flat – Thailand is almost too easy for cycling! The next morning, the weather looked spectacularly good for the first hour of cycling, but heavy clouds quickly came in from the west coast. 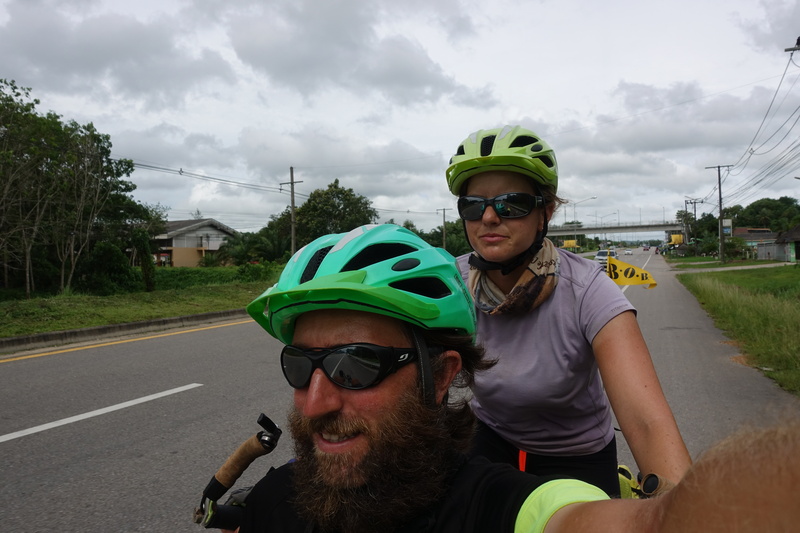 Unlike other days, where Cédric and I were able to find a small stand on the side of the road, we didn’t find shelter for the heaviest part of the rain, and because the day was short and we would spend a few days off of the bike, we just pushed through. 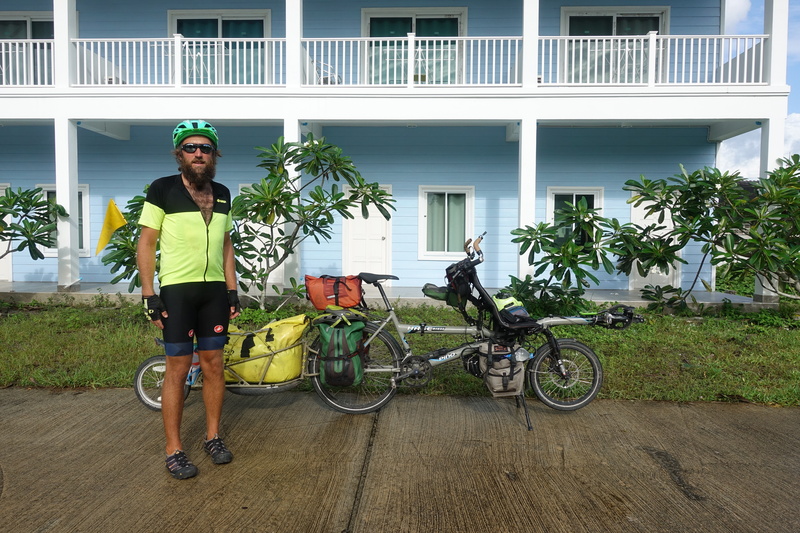 We continued cycling into Krabi as the rain lightened and were nearly dry when we reached the hotel. 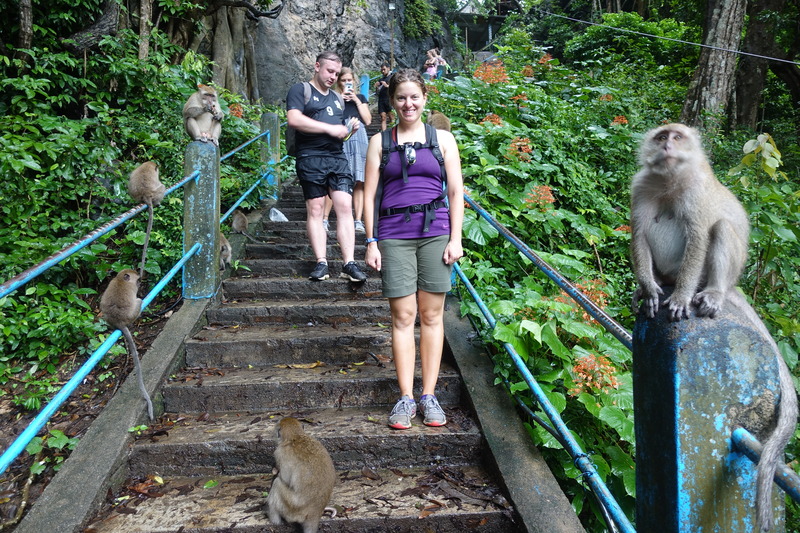 In the afternoon, Cédric and I rented a scooter to see some highlights around Krabi, like the Tiger Temple. 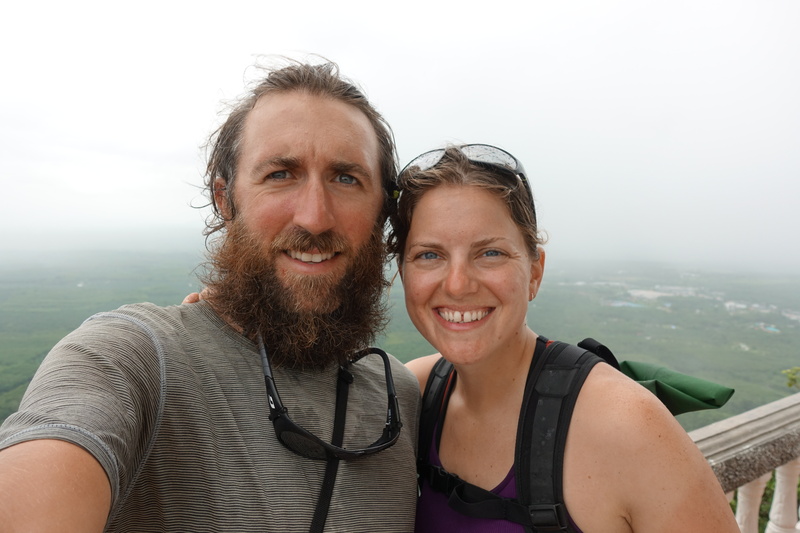 There, the weather caught up with us again on top of the mountain and we only had a few short minutes to admire the interior landscapes before the next shower rolled in and blocked our view. 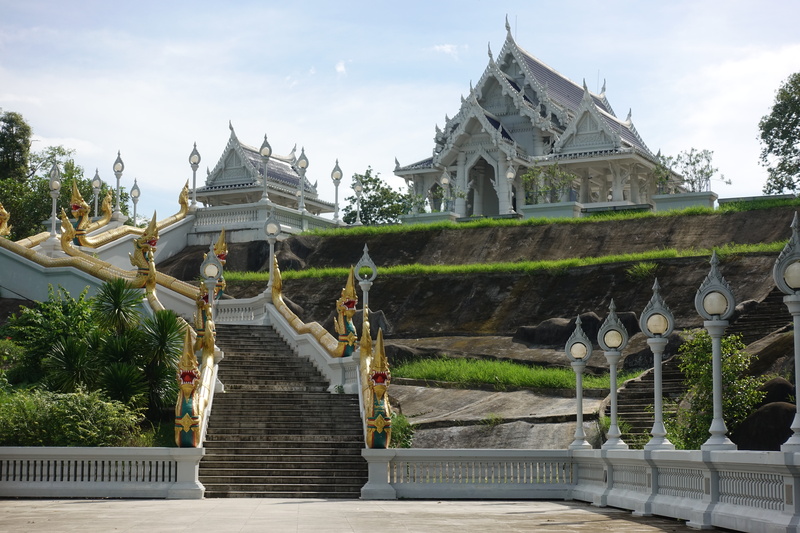 When we reached the bottom of the temple, the weather cleared and we explored the “Wonderland” where monks reside in small houses underneath the cliffs. 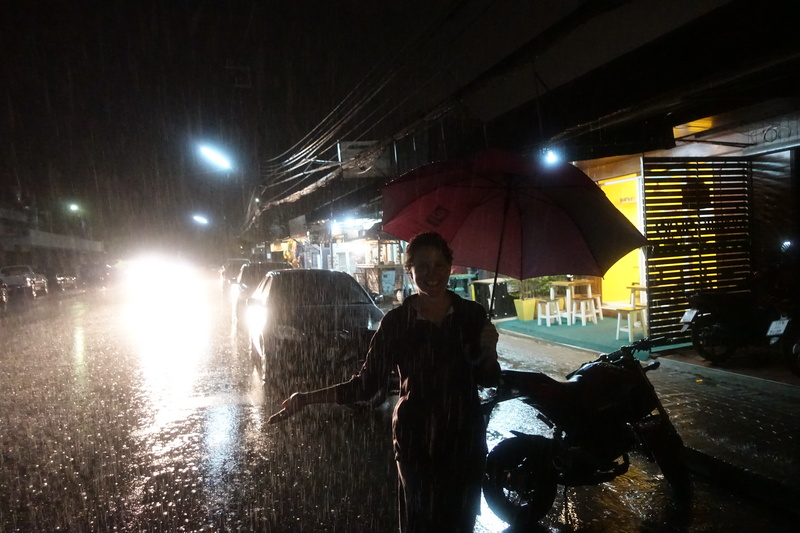 Our evening in Krabi ended with us exploring the night market with yet under another heavy downpour and Cédric walking calf deep in the cities puddles. 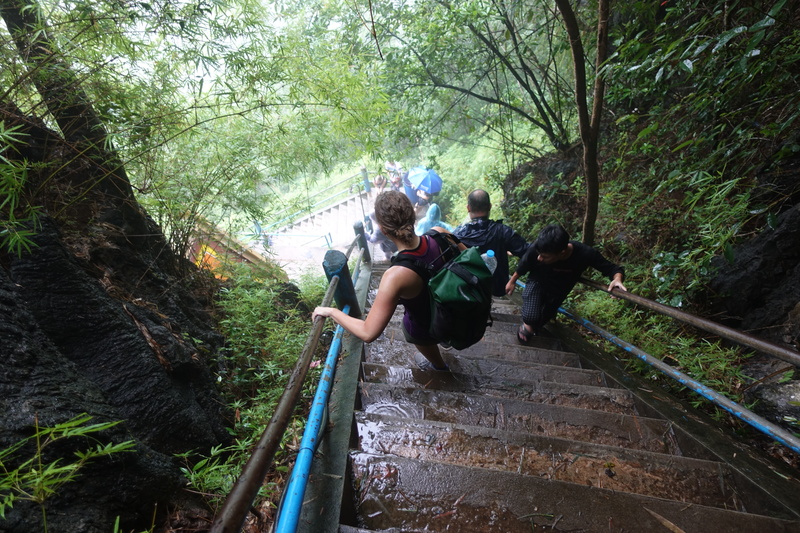 Climbing the 1237 steps to the top of the Tiger Temple, and comparing with other people it looks like the last six months of cycling as made us super-fit. 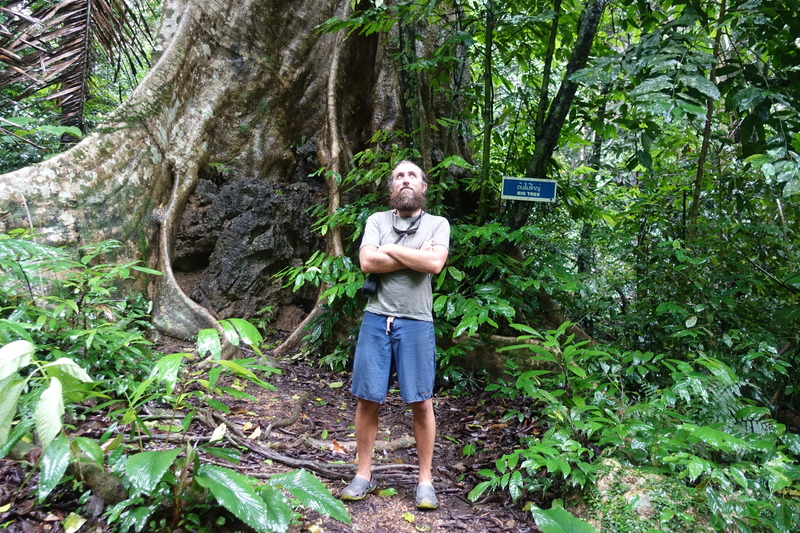 The hermit in the jungle… able to stay months with the exact same outfit. When water reaches your ankle in the street, not sure the umbrella is of any use anymore. 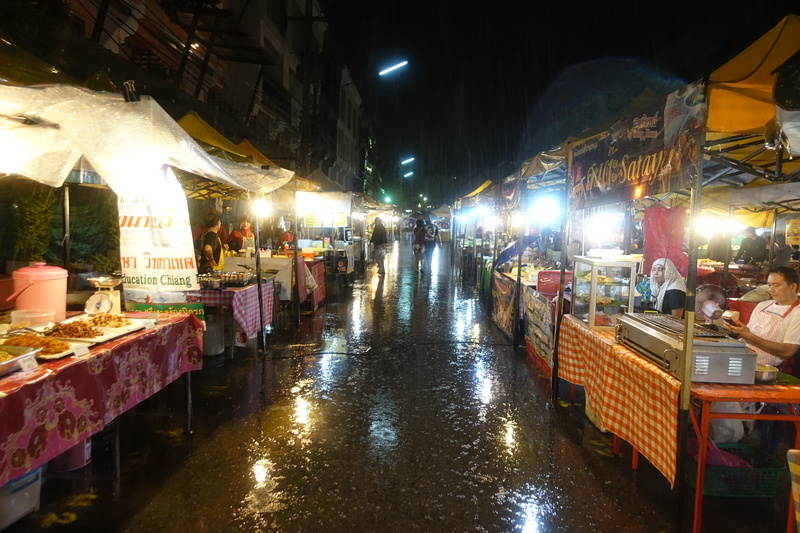 Despite rain, the market goes on! 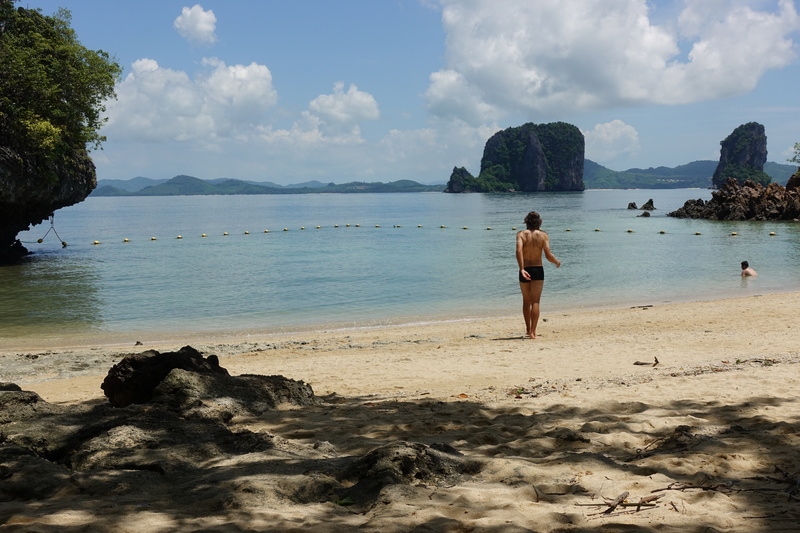 The monsoon weather had finally cleared for the time being, so Cédric and I decided to spend the next two days enjoying the dry weather. 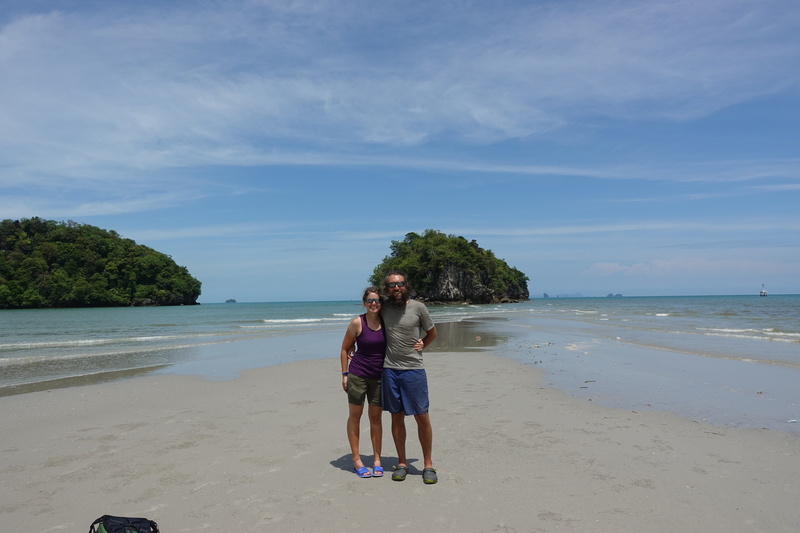 We spend the first day scootering around and exploring the beaches near Ao Nang. 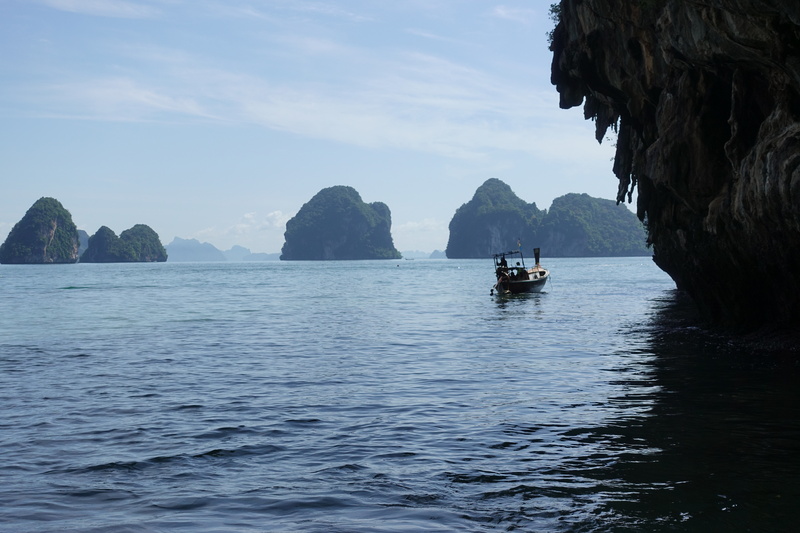 The second day, we took a snorkeling tour to the Koh Hong islands off the shores of Ao Nang. 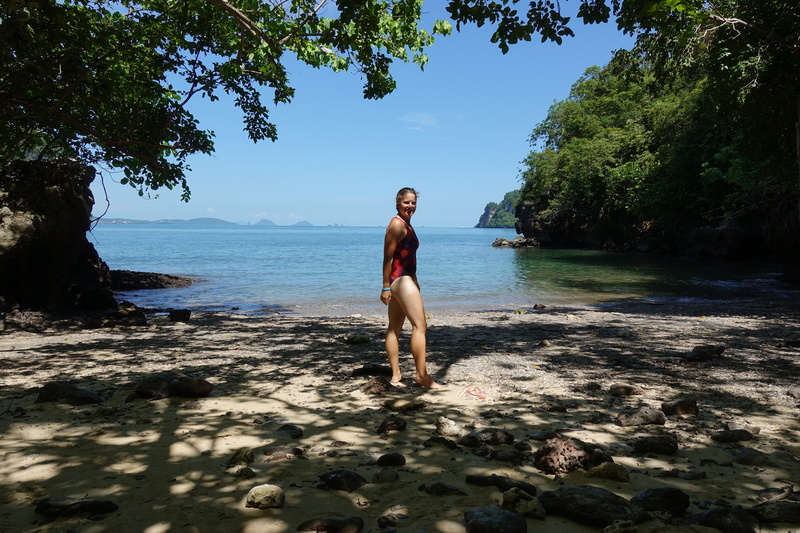 Because it was the low season, our group had a few beaches to itself and enjoy the scenery and warm waters. A small step for man a giant leap for mankind. 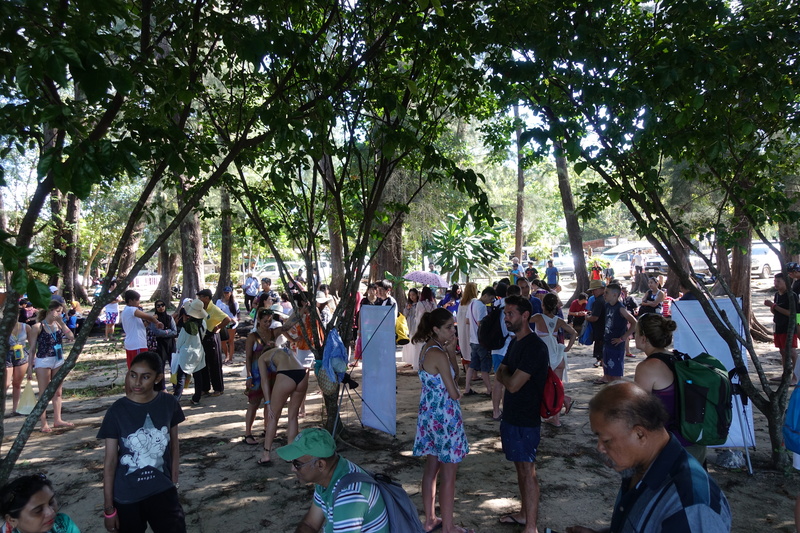 Everyone waiting for their boat trip – and this is the low season. 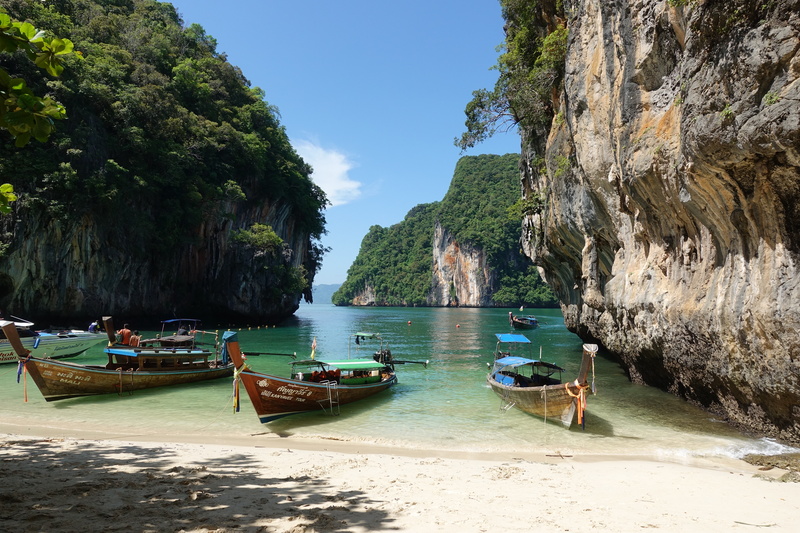 We cannot imagine how Krabi must be when all the hotels are full… One room per hotel booked, one couple per room – it’s a bit exagerated but now multiply by 50 rooms per hotel sold out during the high-season (the winter in the northern hemisphere). 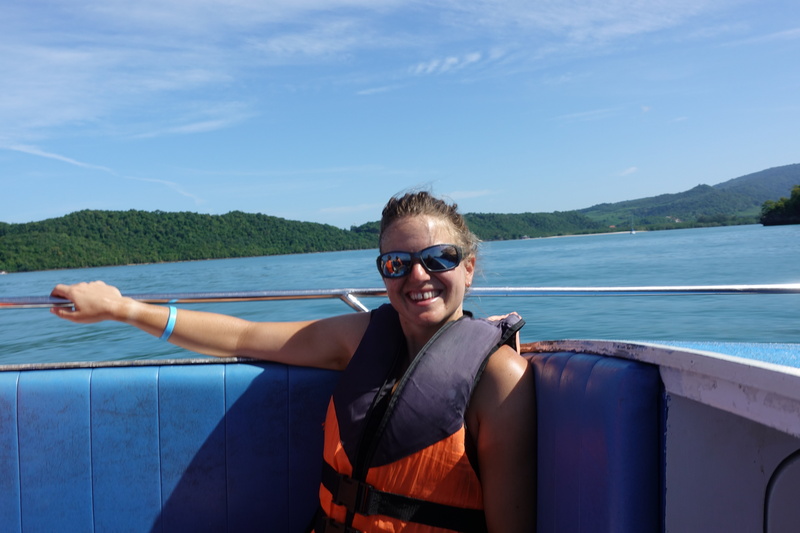 Life-jackets are mandatory even for snorkeling… apnea is called dip your nose in the water! 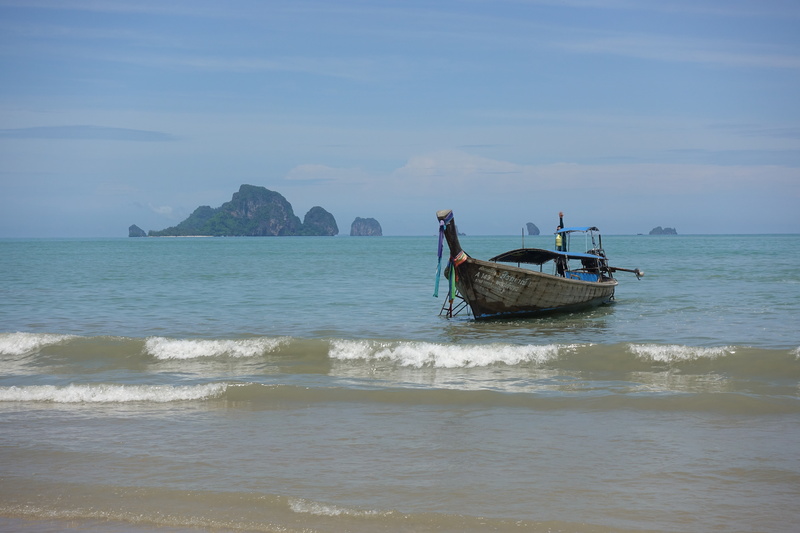 There’s a certain recurrence of capsizing tourist boats in Thailand. 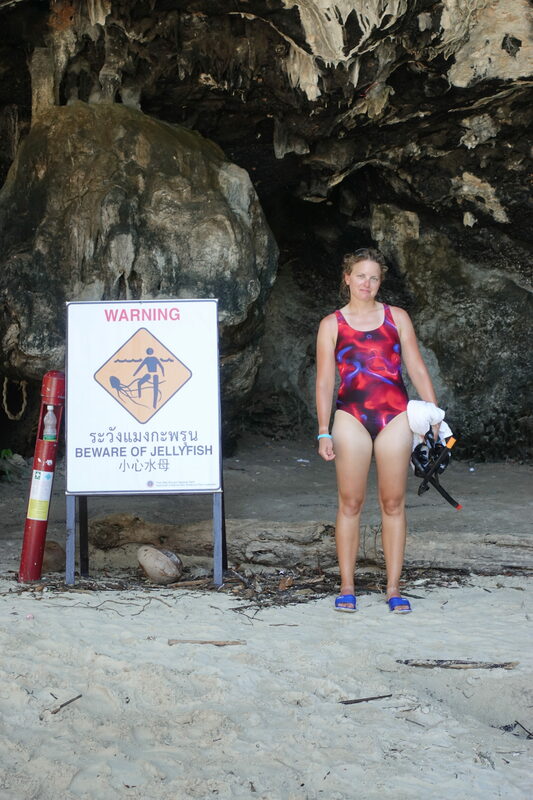 Plus the fact that lots of Asian tourists do not know how to swim, there are lots of accidents every year (although the shore is often only a few hundred meters away and the water like a bathtub). 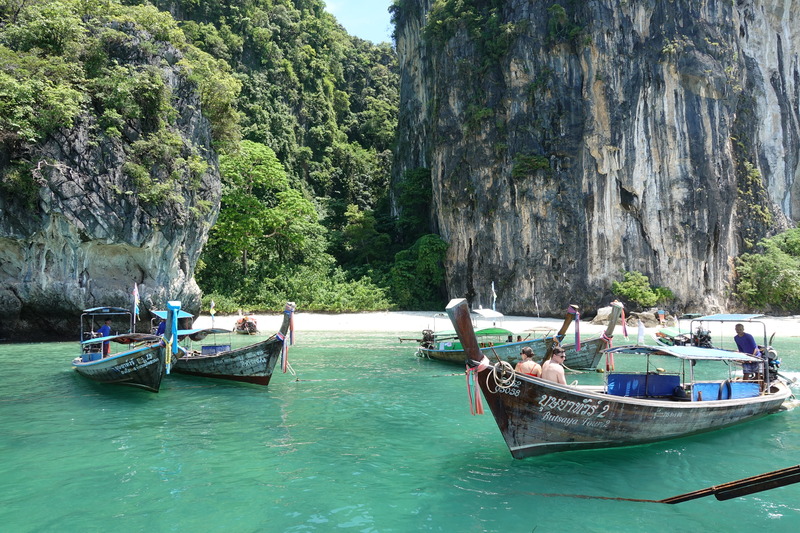 Thailand feels for sure like a much more touristy destination with better hotels and infrastructure, however it feels like a lot of people avoid the months of June and July. 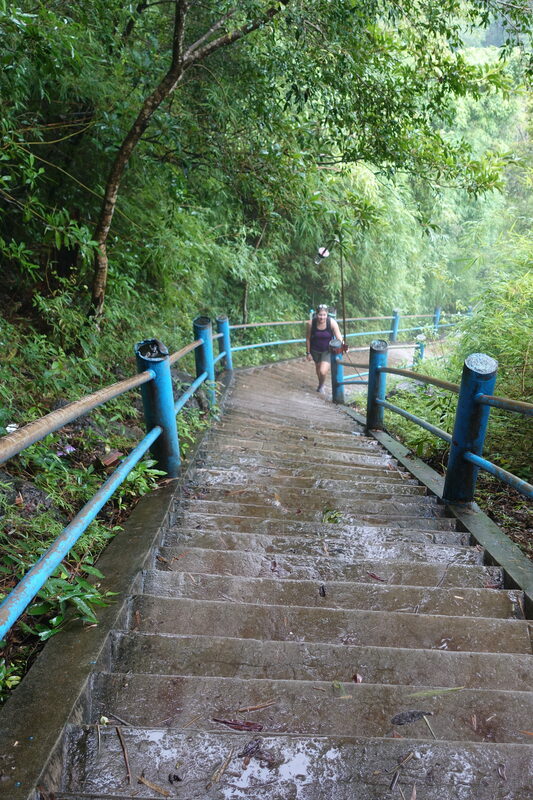 The monsoon rains are strong and it is better to hide from them, but the rain is almost like the temperature of a shower, and it rarely lasts more than 30min every few hours (at worst). 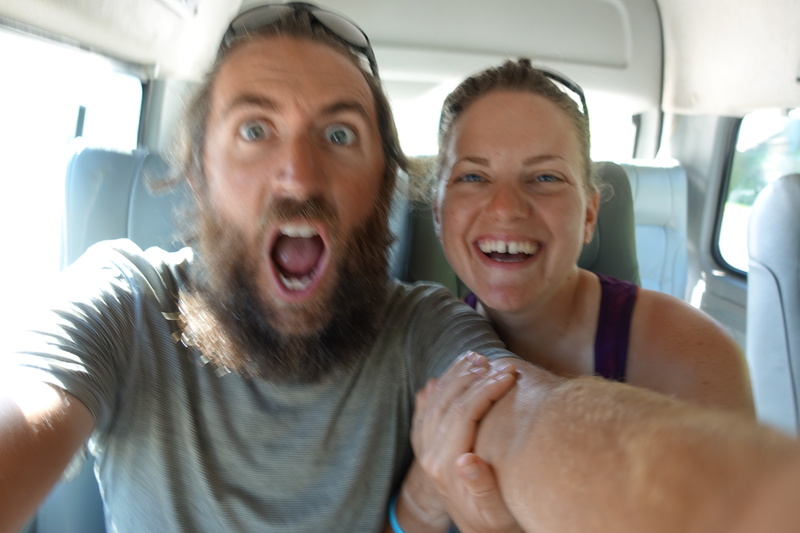 Given that there is on average a shop/cafe/restaurant every 500m, the showers just trigger our next stop location. 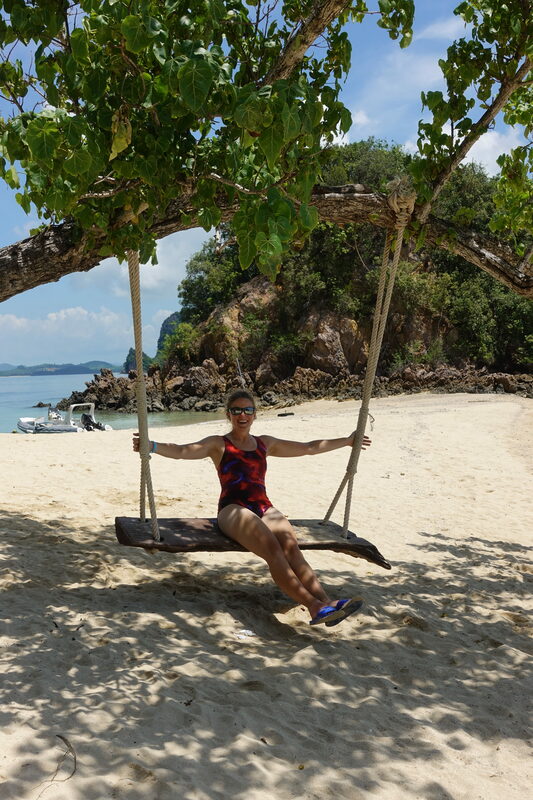 On the other hand, we get to enjoy beaches and other sites just for ourselves, and compared with the high season, hotel prices are often discounted up to 80% (particularly in usually very touristy destinations – it felt like there were more hotels than guests in Krabi!). Needless to say, at maximum 10/15€ for a spotless 3* hotel for two people with sometimes even swimming pool and breakfast, we haven’t (and probably won’t) use the tent around here!